It’s been awhile since our last post. We have been super duper busy with the baby and work. But that does not mean we have forgotten about designforadotion. We have started to compile a list of sites where you can shop and help others, or donate to help others, or simply read about those helping others. As we gather more sites, we will be updating the list. Also if you have any recommendations please forward. We are looking for design related people or companies helping other people. The best phone call ever! This January brought us the best phone call ever: we got placed with our son!!!! The year started off poorly since there was a death in the family, not to mention that we were feeling dishearten by the lengthy adoption process. However, at the end of the month, our lives would change forever!! With adoption, you typically have 2 scenarios: you are either matched with a birth mom who is in her 7th month of pregnancy, or a birth mom decides after delivery to make an adoption plan. You never really know which one will happen for you so you should be prepared for both. As would happen with us, we got an email for a potential match with a baby (our son!) who was born 4 days earlier! This had been our second potential match of a baby already born (the first being the day before this one). We had received several potential matches over the course of 8 months, but this was the first time for us in the span of 2 days that we got matches with babies already born! I have to say that this scenario is very exciting since you get to see pictures of the baby!! The flip side is everything happens in lightening speed and you just have to do things quickly. This is why it pays to think ahead! We were so happy that we bought all the items for the nursery ahead of time since we had 2 weeks to prepare for our baby!! Of course, most things could be assembled after we brought our son home, but we wanted to paint the nursery before he came. Since we were out of state, things got a bit more complicated than matching in state. We couldn’t just go pick him up and bring him home since there are a lot of clearances & protocols that must be followed before exiting the state your baby is born and entering your home state. So potentially, you could wait for over a month if either state bureaucracy lengthened the process. That could get very costly if you have to stay in a hotel for a month or so. Luckily, our son was born healthy, just slightly under weight, but he was discharged from the hospital in a few days. Our agency then placed him in foster care with a loving couple that was taking care of our son and a baby girl as well (the couple had also adopted years back from our agency). They were amazing and made waiting a lot easier since we knew he was loved! The first thing on our mind was to meet our baby!! We got plane tickets for the following weekend and both sets of grandparents came to meet him as well. We were very fortunate to have close friends in the city where our son was staying and they graciously offered for us to stay at their house with the baby. That made a world of a difference since we felt at home and didn’t have to worry about anything, just take care of our precious little one! We then had to fly back home without our son since we didn’t know how long the clearances would take. That was very painful and tearful for the both of us but we had such wonderful foster parents which made it a lot easier to handle. However, as luck would have it, as soon as we flew back home we’d have to turn right back around to take possession of our son! In order to start processing the interstate compact clearance, the state requires the hospital records of the baby’s birth be released to the agency. The city in which our baby was born is notorious in taking weeks to release the medical records, which meant we’d be waiting for awhile. Luckily our agency called numerous times to find out the status which helped to expedite the process. This part of the process took 2 weeks and once the records were released we flew in to take possession of our son and start the waiting game with the interstate compact clearances. The state we were adopting from has a very quick turn around for approvals, however, our home state was not known for it’s promptness. We, again, were able to expedite the process by contacting our governor’s office to see if they could help us bring our baby home soon. We could not leave the birth state of our son until the interstate was approved. Part of our family lives in that state so we took this opportunity to introduce our baby to his great grandparents, and numerous loving relatives. This was a wonderful bonding experience for our family, and our baby had his first of three welcome parties! After over a week, we finally got our clearances and were able to fly home. I have to say, that even though our state took awhile, they were actually quite thorough and made sure all the documents were in order. Our total wait period from the time we got matched to our state clearances was a little over 3 weeks. So if you are adopting out of state and don’t have friends or family to stay with, be sure to budget a lengthy hotel stay if you want to be there the whole time or try to split up your time like we did. Be sure to enjoy this time, even though all you want to do is come home with your baby. The hardest part is getting matched, the clearances will take their course and it will get done. All you need to think about is the love you’ll be showering on your baby forever!!! Since our crib section has received numerous hits from around the world, we’ve decided to give our 2 cents worth of critique on other baby products. We are urban dwellers so, for us, we had many requirements when deciding upon a stroller. First, it had to be compact since we live in a small house and don’t have the luxury of extra space. We also walk everywhere and we didn’t want a stroller to take up the whole damn sidewalk when walking and have people grunt as they have to pass some SUV sized suburban stroller! Second, it had to be light weight to carry it in and out of our house and around town in those quaint stores that invariably have steps into their shops. Third, it had to fold easily since we have a compact car and again, space is tight in our trunk. And lastly, it had to be visually appealing since we’d be pushing it along with us for at least 2 years! Now we could have been snobs and decided on an expensive stokke stroller (I’m not going to lie, their high chair is at the top of our list) but as you can tell from our other product selections, we like high design but with an affordable price tag. We knew getting a stroller would mean it would likely be made in China (unless you could afford stokke), as are all other baby products but we wanted control in where it was being designed – so no Uppababy that are designed and patented in China. So unless we were going to buy a wooden stroller made by the Amish, we resigned to the fact that nothing is made in the USA anymore. Since we’ve been waiting for a couple of years now for a baby, we’ve had a fair bit of time to research different strollers. At first we thought we’d get the Baby Jogger City Mini stroller (designed in USA). It fit all of our requirements: you could fold the stroller in half with one hand, it was small, had cool colors and was affordable. Even our favorite Mexican singer Lila Downs had one and she lives in New York City (she also adopted a baby!) But the more we thought about it, we realized we weren’t too happy with the City Mini. Our problem was twofold: the stroller would not accept a car seat unless you paid over $50 for a car seat adapter, which at that point made no sense since you could buy a Baby Trend Snap N’ Go for the same amount of money. Plus, the adapter didn’t let you fold the stroller in half, and if we decided to buy the Snap N’ Go then we’d have 2 pieces of equipment we’d have to store in our house. Our other reason stemmed from the fact that when we first wanted the City Mini they were still fairly new and hip. Once Babies R Us started carrying them, we saw them everywhere and we just plain lost interest in that stroller. We stumbled along trying to find the next best stroller. 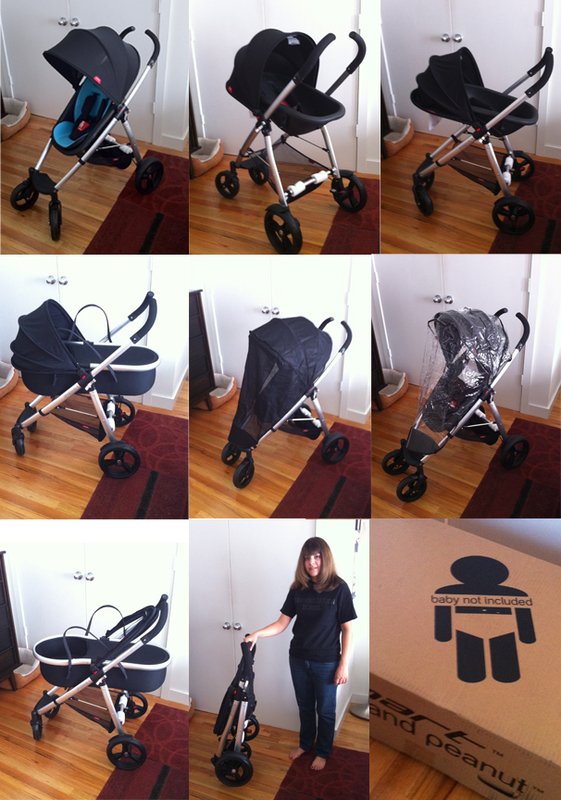 We just happened to get an email about a new product and fell in love with it immediately: phil&teds smart stroller! The company is from New Zealand (if you order online, you will be billed from New Zealand so be sure to tell your credit card company that this is not a fraudulent purchase) and has very modern, sleek designs. It only comes in black so if you know architects you’ll know that black is the only ‘color’ that matters. They do sell extra padding inserts with fun colors if you want some flare. What we absolutely love about the product is that it’s very compact and yet still very versatile. You can reverse the seat to face you or face out with their verso adapter, which is not expensive at all. It will accept a car seat without an adapter and you can add a bassinet. We thought this was ingenious since most bassinet / stroller combinations are really expensive, whereas their peanut bassinet was very reasonably priced and could fold down flat when storing. Aside from the various adaptable configurations, the seat itself is an engineering feat. They designed a foam seat that is molded into one piece, so if there are any spills you can literally hose this stroller down! As for size, it’s super light weight and small enough for your mini cooper as they so keenly said on their website. This is definitely a great find that not many know about… you can tell this is a hipster stroller when you have the likes of Jack Black and Halle Berry sporting their phil&teds strollers! Lastly, what struck a chord for us, was that they have a foundation that gives back to the community called phil&thropic. They have numerous different programs for children in need making our purchase even more worth it. 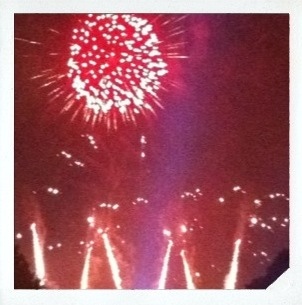 Designforadoption would like to wish everyone a happy and prosperous 2012! We would also like to take this moment to thank all of you for your continued support in 2011. Your support has provided so much encouragement for us along this long winding journey to adoption and your generous donations have helped to remove many of the financial hurdles along the way. This adoption journey has opened our eyes to a world of experiences we would have never experienced otherwise. We are praying that in 2012 we will finally be matched with a child and we look forward to the day when we can finally announce with much enthusiasm that we have been matched! This past year has seen its ups and downs. In 2011, we were presented 6 different potential birth families, three of them did not select us, one selected us then changed her mind about adoption, one disappeared without selecting anyone, and we had to decline one, because of too much drug exposure. It has been heartbreaking at times, but with the support of family and friends, we have been able to move forward and remain hopeful. We wish everyone a New Year full of hope and new and exciting adventures. We look forward to sharing our journey in the new year and meeting as many exciting people as we did this year. Our sincerest Thanks for being a part of our journey in 2011.
Who says big change cannot start off small? We don’t believe that and neither does punypixel, a new clothing line just launched by a good friend of ours. punypixel starts with the premise that no step is to small, “no matter how puny”, so they are thinking big! punypixel’s primary mission is to help children around the world by partnering with organizations that help make a difference in children’s lives. With the launch of their line of super cool, socially and environmentally responsible kids clothing, they are taking their first step towards making this mission a reality. For their inaugural project, punypixel has teamed up with Cradles to Crayons. With every purchase you make punypixel will be helping to fund Cradles to Crayons’ mission of providing necessary essentials to homeless and low-income children. Visit punypixel and help make a difference. Way to go punypixel! We love the concept and all the PunyPixels, Leo, Irs, Sid, and Mike! Check out our new products available for sale on our Products Page, just in time for the Holidays. 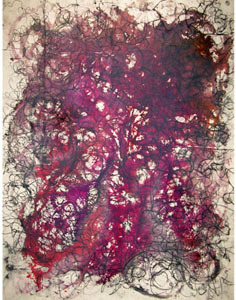 There are various prints available including Field of Disturbance which was exhibited at City Hall. Today I would like to take a pause from our normal adoption blogs, to take a moment and remember my Mom. Seven years ago today she took her last breath in a room surrounded by her loving family. That was a day that will forever be a part of my memory just as my Mom will forever live on in all of our memories. Every year on this day I take a moment to remember all that she meant to me and to our family and I ask God to take care of her in her final resting place. We all miss her and we will always carry her memory with us in our hearts for the rest of our lives. That year was a very difficult year for us, filled with joy from our engagement and sorrow from the loss of a beloved parent. This year has also definitely seen its ups and downs, not just for us with our bumpy adoption journey, but for many of our family members and close friends. Many of our friends have lost a beloved parent this year and several of our family members and close friends are either battling cancer themselves or helping a loved one through their difficult battle, or even coping with the loss of a loved one while battling cancer. Therefore this year along with remembering my Mom, I also wanted to take this time to stop and say a prayer for our family and friends. These are the times in life when we all need to stop and reflect on the little things in life that we tend to overlook. The things that add richness to your life, the laugh of a loved one, the smell of your favorite food, or simply the warmth of the sun on your skin. The things that enrich our life and add beauty even during difficult times. We should all find a few seconds in our day to stop and just experience life. For everyone experiencing a difficult time, be strong, hang in there, take a moment to find the hidden beauty that life has to offer, focus your grief and anger towards something productive and fight the battle, laugh, cry, and make new memories with loved ones and most of all experience all that life has to offer.